World of Warcraft: Classic - is the nostalgia trip worth revisiting Azeroth? To the uninitiated, it might be a little tricky to grasp why it’s such a big deal that Blizzard are stripping down World of Warcraft to the state it was back in 2004 for the release of World of Warcraft: Classic, but if you were to compare the current game, to the ‘Vanilla’ experience, there are so many changes and enhancements - from the graphics, to the mechanics, to the very lay of the land - that the game can sometimes be barely recognizable. If you’ve spent any time at all in the past couple of expansions for WoW, you’ll have come across plenty of players decrying how far the game has fallen since its glory days, and how you just wouldn't be able to understand that sentiment if you’d never played old-school WoW. This began as a very vocal minority, but has been bubbling ever-louder under the surface over the past several years, especially since Blizzard updated much of the old-world content back in 2010 with the release of Cataclysm. But with the release of WoW Classic, those players are finally getting the chance to go back and rediscover what they believe made the game so great all those years ago. It’s been a year since Blizzard announced WoW Classic at BlizzCon 2017, and now at this year’s convention, both those attending the show and those with a virtual pass, had an opportunity to try out a limited Classic demo. You’ll see the word ‘nostalgia’ banded around fairly frivolously when it comes to any conversation about WoW Classic, but there really is no better way of describing the wave of emotion that flows over you as you log into the demo if you played WoW in those Vanilla, or even pre-Cataclysm years. The original title sequence boots up, with the now famous intro music and we’re presented with the original character creation menu. Gone are the sleek updated models we’ve grown used to, and the jutting muscles and plasticine hairlines of yesteryear are back. Running around the world with the sharply defined character designs seen in WoW’s current expansion, Battle for Azeroth, would surely take away from the aesthetic Blizzard are trying to create here. Building an old-school character, complete with grimacing scowl and jerky walk-cycle, is a grounding preparation for the forthcoming gameplay experience. For the BlizzCon demo, we only had access to two of the old zones, but both iconic in their own way. Horde characters play through the Barrens, and Alliance characters are thrown into Westfall. Both of these locales are where you’d find yourself once you’ve left your starting zones and gotten into the meat of the game. In the current WoW game they’d barely be a blip on your leveling journey, but for the old timers both of these locations were where WoW really began to open up (at least for human, and orc/troll players). Instead, you were thrown into a wide open space and trusted to explore that ‘world’ you’d heard so much about. We logged into Westfall just as the demo began, and the sense of confusion amongst the player-base was palpable. In Classic there are no mini-map markers letting you know the locations of quest-givers, and only the slow-scrolling quest text to indicate where to find the enemies you’ve been asked to take care of. For many, this complete lack of direction was clearly overwhelming. The global chat was a chaotic mess of players asking where to find gnolls and bandits, with many picking a random direction from the quest hub and striking out to explore the region, hoping to get lucky and happen upon the right kind of enemy. The experience was most conspicuous when we logged in on the Horde side to check out the sprawling savanna of the Barrens. In current WoW, the zone has been split up into two much more manageable chunks, but in Classic it’s hard not to feel intimidated by the sheer size of the place. With no mount to speed up our journey, and no markers telling us where to go, we were left to meander around the vast expanse, occasionally stumbling upon the raptors and tallstriders we’d been asked to take care of. We’d been here plenty of times in the years since Vanilla, and knew the lay of the land, but with no directions to guide us we felt ourselves experiencing the Barrens as we did 14 years ago. The world suddenly felt big, and scary, and we were thirsty for more. Logging back into Westfall, we vaguely recalled in which direction the decade-old Defias Brotherhood could be found, and managed to stumble across the enemies we needed to slay. It was when we entered combat with our Night Elf Hunter (and trusty pet boar) that it became clear how jarring an experience this could potentially be for modern gamers used to the quality updates WoW has seen over the past 14 or so years. Nowadays, players running around the same area can band together easily to rack up the kills to complete their quests, but in Classic, if you’re not in a party and you’re not the first person to deal damage to an enemy, you’re out of luck. You get no credit for the kill - and no loot when the enemy is felled. It was a frustrating couple of minutes trying to get the first hit in on a bandit surrounded by dozens of others trying to do the same, but we eventually joined forces and partied up with a Gnome mage, and everything became smoother. We let off an Arcane Shot from our gun, tagging the bandits, which gave the Gnome time to let off a fireball with a long cast time. 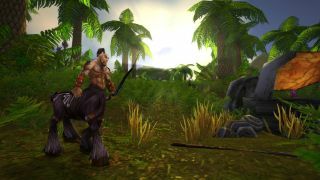 It was a key moment that stood to highlight the camaraderie of an MMORPG, that ‘massively multiplayer’ aspect of WoW that critics said had been lost amongst all the updates. We casually chatted to others we’d picked up in our party about what they thought of the demo, and about BlizzCon generally, and recalled the friends we’d made questing in almost identical circumstances all those years ago. Yes we were battling against the game’s mechanics, but we were tackling it as a group. Still, each fight felt like a slog. As a Hunter – WoW’s most popular class - you’re supposed to be using ranged abilities, but if an enemy comes within five yards of you, you’re unable to fire your weapon, meaning we had to go through the motions of firing off a Concussion Shot to slow down the bandits’ movement, while constantly running backwards away from the fight to keep them in the ranged sweet spot. It all feels very archaic, and serves as a reminder that some of this stuff was changed for a reason. Overall, the consensus in the global chat was pretty apt. Half the people were loving the nostalgic experience, but half were shocked at the many seemingly illogical antiquated mechanics, and among the jokes asking when Blizzard were adding pandarens to Classic. There was a feeling that most people checking out the demo would dip their toes into old-school Azeroth, but it’s really only a dedicated, but admittedly still sizable, handful of players who’ll get the most out of the Classic experience. The slower, much more immersive gameplay is definitely an attractive proposition and it’s easy to get lost in, but alongside that rose-tinted view of the past, you start to see the cracks in the decade and a half old game design.